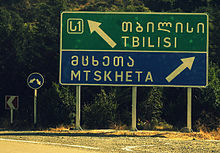 Romanization of Georgian is the process of transliterating the Georgian language from the Georgian script into the Latin script. This system, adopted in February 2002 by the State Department of Geodesy and Cartography of Georgia and the Institute of Linguistics, Georgian National Academy of Sciences, establishes a transliteration system of the Georgian letters into Latin letters. The system was already in use, since 1998, on driving licenses. It is also used by BGN and PCGN since 2009. Despite its popularity this system sometimes leads to ambiguity. The system is mostly used in social networks, forums, chat rooms, etc. The system is greatly influenced by the common case-sensitive Georgian keyboard layout that ties each key to each letter in the alphabet (seven of them: T, W, R, S, J, Z, C with the help of the shift key to make another letter). Extended characters are mostly Latin letters with caron (haček – ž, š, č̕, č, ǰ), with the exception of "g macron" ღ → ḡ. Archaic extended characters are ē, ō, and ẖ (h with line below). ^ a b c d e Archaic letters. ^ a b c d e f g These are influenced by aforementioned layout, and are preferred to avoid ambiguity, as an expressions: t, j, g, ch can mean two letters. ^ Initially, the use of y letter for ყ is most probably due to their resemblance to each other. ^ United Nations Group of Experts on Geographical Names (2007). Technical reference manual for the standardization of geographical names (PDF). United Nations. p. 64. ISBN 978-92-1-161500-5. Retrieved 7 January 2013. ^ Evertype.com: ISO 5426 mapping to Unicode; Joan M. Aliprand: Finalized Mapping between Characters of ISO 5426 and ISO/IEC 10646-1; The Unicode Standard: Spacing Modifier Letters.